You are able to import your Customer and Vehicle, Supplier and Stock Listings from previous software into Workshop Software. The data needs to be in a .csv file format which is a type of Excel spreadsheet and some mandatory fields need to be populated. We have created templates, which are available within this help-guide, to assist in importing the data. These will give you a guide as to how the data needs to look and also advise of any mandatory fields or specific format requirements. 4. You now need to match your data, in the far left column called Yours with the field you want it to populate in Workshop Software by selecting the correct option in the far right field called Ours. 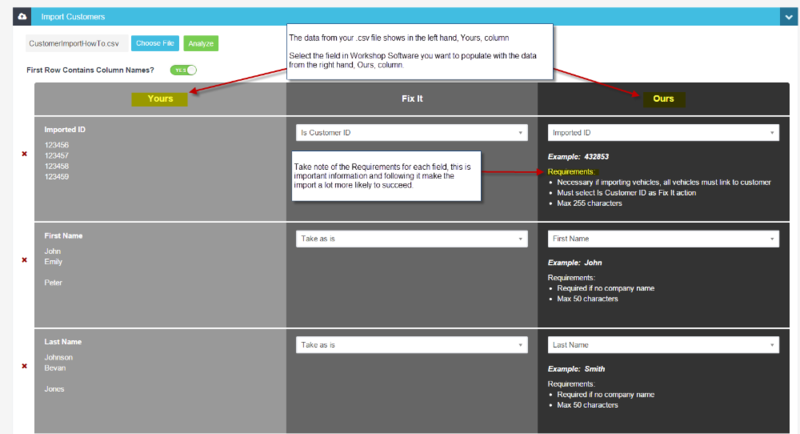 The middle field, called Fix It is used to format the data correctly and may not need to be used. If the import is successful a green drop down bar will appear advising you how many records were imported and how many, if any, we're not imported, as above, the Event Log can be used to show the reasons why data didn't import. Once data has been imported it can be cleared by contacting Workshop Software on 02 9979 6090, clearing any data will also mean clearing any invoices created. In order to prevent errors it is a good idea to import a small amount of data first (4-5 entries) and if you are happy with how it imports you can then import the remaining data. If you are importing customers and vehicles each will need to have an ID number to link them, eg, if customer Jane Smith has two vehicles than Jane's ID number and the ID number for the two vehicles will all be the same. Customers will need to be imported first. Any fields that contain phone numbers can only contain numbers and spaces, any dashes, brackets or letters will need to be removed prior to import. When importing customers, first and last names need to be in separate columns for import.